Approximately 2 to 3 out of every 1,000 children in the United States are born with a detectable level of hearing loss in one or both ears. More than 90 percent of deaf children are born to hearing parents. Approximately 15% of American adults (37.5 million) aged 18 and over report some trouble hearing. The Hearing Loss Association of America provides statistics and fact on hearing loss. Hearing loss can happen when any part of the ear is not working in a manner that mirrors the hearing world’s hearing development. This includes the outer ear, middle ear, inner ear, hearing nerve, and auditory system. When hearing loss occurs, the brain adjusts in miraculous ways and individuals develop visual, social, and amplification strategies that become part of who they are. Those with hearing loss have a unique way of experience the world. 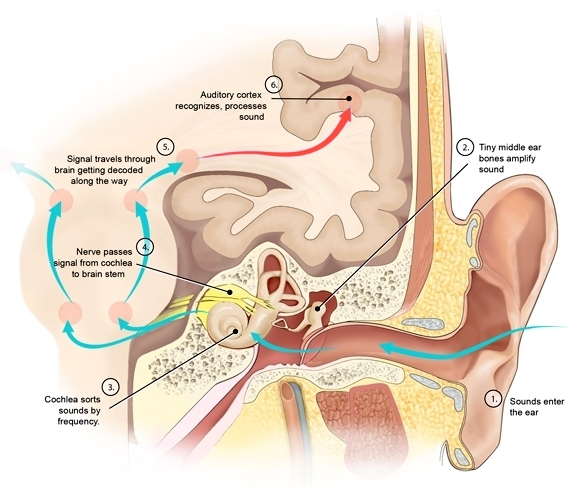 Gaining an understanding of this unique viewpoint, and of the strategies that allow those with hearing loss to live their best lives is essential. Parents, teachers, and professionals become teammates for individuals with hearing loss, advocating, supporting, coaching, and teaching - to help those with hearing loss become their best self. Starkey Hearing Technologies provides a way for those with normal hearing to gain further understanding of different level of hearing loss through their hearing loss simulator. It allows the user to hear what different levels of hearing loss sound like. Gaining a better understanding of hearing loss will help team members identify strategies that fit the unique strengths and challenges each individual, deepening their relationships, and supporting their best life. The National Deaf Center is a technical assistance and dissemination center. It is funded by the Department of Education’s Office of Special Education Programs (OSEP) to support postsecondary outcomes for individuals who are deaf, deafblind, deafdisabled, hard of hearing, or late deafened. The center’s activities draw on evidence-based strategies to educate and engage with stakeholders across the nation. They seek to create conditions for optimal success in a way that recognizes and honors the experiences, perspectives, and strengths of deaf individuals. Centers for Disease Control and Prevention: Hearing Loss in Children provides information for parents and professionals including basic information, screening and assessment, and intervention.